We're getting closer to Spring and warmer weather and hopefully more sunshine. Yesterday was wonderful. I went with Mom in the truck and basked in the sunshine while she went into places I couldn't go in. It was so nice to finally be able to lay in the sun. Today, we're back to no sun and it snowed. I love the snow. I went out and played in the snow a few times already today. We have some new fabrics in from Northcott and Quilting Treasures that came in last week. There are 2 different label panels, camping fabrics, EMS themed fabrics and some quilting themed fabrics, too. 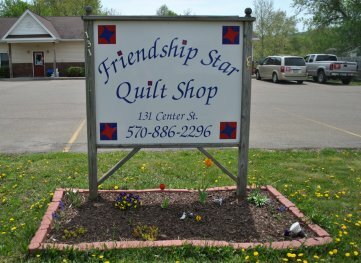 Next week, I know some of you are going to Quilt Retreat. I hope you will stop in to stock up and, most importantly, give me some ear scratches before you go. Grandma is going but Mom and I will be holding down the Shop. There isn't much happening right now in the Shop. We are not sure when the Sewing Machine Doctor will be in. He is not feeling very well. But Mom can clean your sewing machine if you need it cleaned while the Sewing Machine Doctor is out. Our price for cleaning a sewing machine is $49.95 plus tax. We don't want anyone to have to wait if you need your machine cleaned. As you know, Mom has been trying to get Necchi sewing machines into the Shop. We have our fingers crossed that we will be a Necchi Dealer by mid-April. We have ordered 4 different sewing machines to start off with. Necchi sewing machines are a Division of Janome. We are also hoping Mom can get into their sewing machine repair school by late May or early June. We are very excited to become part of the Janome family. This Saturday, February 4th is our Free Pattern and Demo Class. It starts at 10AM and should be over by 11AM. You must attend the Free Pattern and Demo Class in order to receive your free pattern. The class fills up fast & patterns are limited. This is one of my favorite class days. I get lots of attention and sometimes even get an extra treat. We will also be having a Sale on our Minky and Fleece. Take 30% Off all Minky and Fleece. The dates for this Sale are 2/6-2/18. Minimum cut is 1 yard. We are looking to make room for more 108" Wideback fabrics. So, the Minky and Fleece need to go! Fabric Challenge Projects are due by Saturday, February 11th. Voting will be Monday, February 13- Saturday, February 18. Voting is done by our visiting customers. Even if you didn't participate in our Fabric Challenge, please stop in and vote for your favorite table runner. All Fabric Challenge table runners will be on display in the second room. It's a short month and then it will soon be Springtime!